If you're looking for top-notch kid's birthday party ideas, then take a look at this informative Rizzo's Reptile review. You kid deserves nothing but the best party service in the tri-state area for his or her reptile party in NY, so hire Rizzo's Reptile Discovery! 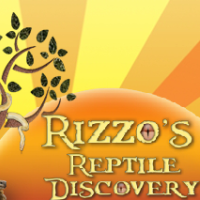 Find here a review of Rizzo's Reptile Discovery in NY that is sure to inspire you to pick up the phone and start planning your kid's party today! Best Reptile Party Service in NY! Calling all reptile and wildlife lovers - here is a perfect birthday party idea for you! 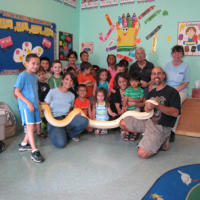 Offering interactive shows with lizards, snakes, turtles, frogs, insects, mammals, alligators and arachnids, Rizzo's Reptile Discovery LLC is without-a-doubt the best reptile party service in the tri-state area. Their whole-hearted mission is to bring children, parents and the whole world together to share in their love and admiration for wildlife and the natural world. Not only will the children enjoy a once-in-a-lifetime look at some of the most exotic and amazing animals on the planet, they will also gain valuable educational knowledge of the animal world. With four different fun-filled programs to choose from, you can't go wrong with Rizzo's Reptile Discovery reptile birthday parties. Choose between the reptile program, the wildlife program, the rainforest program, and the discover green program for your kid's next reptile birthday party. If Rizzo's doesn't offer exactly what you're looking for, then ask about their customized party options! With hands-on participation as a key tool, Rizzo's Reptile Discovery strives to let every kid in on the wonder and joy that wildlife has to offer. Fun for the whole family, Rizzo's reptile birthday parties will take the children on a journey through the animal kingdom that they will never forget. Book a Rizzo's Reptile Party Online! They Take Great Care of their Animals! Not only is Rizzo's Wildlife Discovery great with kids, but they are also great with their animals! The owner, Dominic Rizzo, has had a passion for animals and nature since age three and has made it his lifelong mission to educate and entertain children throughout the tristate area about his passion and love for wildlife. After years of study and research as a herpetoculturist, Dominic is an expert in the field of reptiles and amphibians, and takes much pride in the care of his beloved animals. With over 80 healthy and happy animals, Rizzo's Wildlife Discovery is only continuing to expand their animal-loving kid's entertainment service. Safety is First with Rizzo's! Having a reptile party may be a little nerve wrecking for the parents, but have no fear! Your kids are safe in the hands of the excellent Rizzo's Wildlife Discovery team. The properly-trained staff is committed to abiding by all safety precautions and guidelines to make sure your kid's party is a fun-filled success! Rizzo's will make sure that the animals be treated with proper professional care, and that the children have an enjoyable, care-free party experience that they will never forget! Contact Rizzo's Wildlife Discovery to start planning your child's next reptile birthday party today!